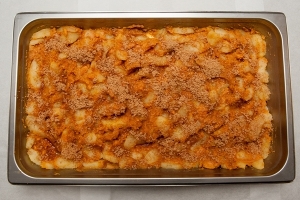 Place 1 quart and 3 ½ cups of drained sweet potatoes in each full-size steamtable pan (12" x 20" x 2½"), that has been sprayed with pan release spray. 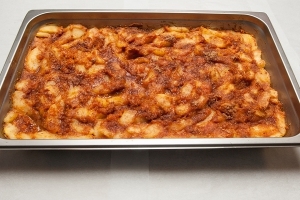 For 50 servings, use 2 steamtable pans. Add ½ #10 can of apples to sweet potatoes in each pan. Combine brown sugar, cinnamon, and nutmeg. Sprinkle ¾ cup sugar mixture over apple/sweet potato mixture in each pan. Dot each pan with 1/3 cup margarine. Add ¾ cup water to each pan. Conventional Oven: 350 degrees F for 25 to 30 minutes. Convection Oven: 300 degrees F for 15 to 20 minutes. Portion with a #8 scoop or a preforated 4 ounce spoodle for each ½ cup per serving. 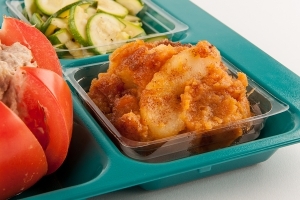 Each portion provides ¼ cup red/orange vegetable and ¼ cup fruit.